Exercise is a great way to improve your physical and mental health. Staying active can help you avoid serious age-related diseases like cancer, and can help you dodge a heart attack and not insignificantly, help lower longevity-busting stress hormones like cortisol. The challenge is to enjoy the exercise you tackle, and keeping it social is a way to make physical activity more fun, and increase the odds of your sticking with your exercise program. Read more: Will running ruin my aging knees? Group exercise can provide support as well as structure to an activity program. 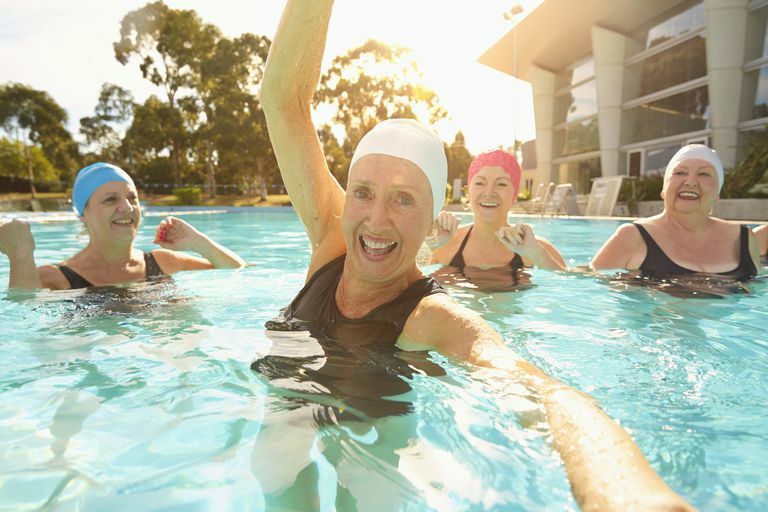 A 2007 randomized controlled trial assessing supervised group exercise for early-stage breast cancer patients undergoing treatment found physical and psychological benefits lasted beyond the 12-week program. Published in the British Medical Journal, the study compared a regimen of two group classes per week and one additional at-home session, with advice to exercise regularly at home in control subjects. Whether it's a result of attention from fitness instructors or support from fellow patients, the social exercisers enjoyed the activity more and remained more active in the months that followed. Even perfectly healthy adults may benefit from the distraction an exercise buddy can provide, keeping your mind off your aching muscles. Being in a structured and social exercise environment has an added advantage: an instructor keeps track of how intensely you're exercising. You don't need to count minutes or repetitions, you simply follow directions. Will High-Intensity Interval Training Trigger a Heart Attack, or Help You Avoid One? Play a Sport: Joining a team sport is a great way to meet people and bond with them. Team sports lead to great stories and social interaction - from bowling to rugby, you'll meet and work together with 10 or more other people. Team sports also will have you committing to a whole season of exercise and physical activity. Pick a sport that’s right for you, check out local community centers and find yourself a team to play for. Find a Buddy: Exercising with another person can help motivate you and make your workouts more interesting. Find someone who is dependable and you like to be with to go to the gym together or run on weekends. You may be more likely to get out of bed for an early-morning walk, run or bicycle ride if you know someone's counting on you for company. Exercise for Charity: 5kms, triathlons and other events are great fundraisers for charity. You’ll meet hundreds of people, get some exercise and raise some money for a good cause - all part of the altruistic behavior which seems to improve longevity. Once you get into the world of charity fundraisers, you’ll be amazed how many like-minded people you encounter, as you experience the satisfaction of pursuing a shared cause. Join a Class: Group fitness classes are also a great way to meet people and add a social element to your workout. Find a class that you enjoy; you may discover that paying for a session also keeps you more motivated than you would be with drop-in classes. Use the instructor's expertise to keep you challenged and performing the exercises properly to avoid an injury, and see if you can make new friends as you go. Staying connected with other people reduces your stress, and can keep you motivated to stick with the healthy activity. If you try a group setting for exercise you may discover, as participants with peripheral neuropathy (nerve damage) in a 2014 study did, that it didn't matter whether they got balance training or Tai Chi. Just being part of a class gave them more motivation and confidence to continue. Mutrie, N, Campbell, AM, Whyte, F et al. "Benefits of Supervised Group Exercise Programme for Women Being Treated for Early Stage Breast Cancer: Pragmatic Randomised Controlled Trial." BMJ 2007;334:517. What Is the Best Way to Measure How Far You've Walked?